Underutilized Design Opportunities: What's Inside Your Elevator? Leaving all that aside, since I got to see the different images in the elevators several times a day, for several days, I started thinking about why elevators (especially in museums) seem to be an underutilized design opportunity for environmental graphics and exhibits. Occasionally, the outside of elevator doors are used as a place to mount informational/directional graphics, but what about the elevator interior (a classic case of a captive audience) or the usually blank walls and alcoves containing elevators? I'm not talking about using elevator interiors as a place to hang the equivalent of "coming events" flyers --- rather how could we use these natural gathering spaces to engage visitors, to set a tone, to provide simple interactive experiences --- involving motion or perspective or acceleration or the "etiquette of elevators", for example? I'd like to collect the best ideas and/or images you've experienced (or would like to experience!) of graphics, exhibits, or architectural embellishments involving elevators and pull them together for future blog posts on underutilized graphic/exhibit spaces in buildings. So either put your elevator musings into the Comments Section below, or put them into an email to me directly. Another typically underutilized space is bathrooms. "Green Buildings", schools, and nature education centers use bathrooms as an opportunity to highlight green materials and human/nature connections and processes. Some science museums do so as well. More could take advantage of these underutilized spaces in museums. Imagine an elevator-related cooperative challenge or some cooperatively controlled gizmo aboard an elevator. Cooperative play would foster a sense of community, transforming this space- traditionally bereft of social interaction! 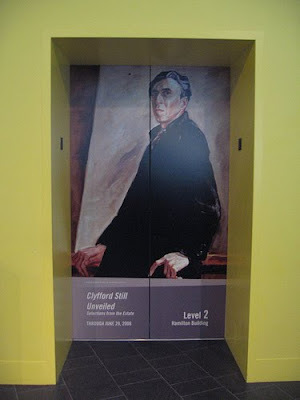 The Tang Teaching Museum and Art Gallery at Skidmore College has, for a number of years now, used their elevator as exhibit space. They feature a continuing series of exhibits called Elevator Music which take advantage of the "elevator environment" to offer a multi-sensory experience. And, I loved Natural Car Alarms a sound piece from Opener 11: Nina Katchadourian: All Forms of Attraction that is an arrangement of bird calls which mimic car alarms. Images were also displayed of the cars in which she installed these natural car alarms and the reactions they generated. At the Tang, the elevator provides a unexpected, quiet, and isolated space that is perfect for these sensory and interactive exhibits. Thanks for pointing out the Skidmore elevator exhibitions! I wonder if it might be possible for the installations to "travel" to other museum's elevators? I'm really not sure whether the Elevator exhibits could travel. To my knowledge the Tang does not use traveling exhibits or travel their own exhibits. In my experience, the Tang likes to have a very close working relationship with the artists it showcases. Though, the person to contact would be Ian Berry, the Associate Director and Curator. His email is iberry@skidmore.edu. Pointe-à-Callier archeological museum in Montreal has lovely little display cases in their bathrooms displaying toiletry objects. Cosmetic bottles, hair decorations, mirrors, etc in the women's; mustash combs, razors and shaving brushes, etc in the men's. It a fantastic use of underutilized space. Back when the Smithsonian's National Museum of American History opened (1964), it was the Museum of History and Technology, with exhibitions that matched that description. The first wall visitors encountered in the public restrooms had a panel that explained the evolution of domestic sanitation systems, complete with illustrations and plumbing samples. Even after the Museum's mission (and name) changed in 1980, those panels remained; the last was removed in 2002 or so, during renovations.